11428 TS Vidya Volunteers Recruitment 2017, TS VVs Online application form 2017, TS VVs Merit List, TS VVs Selection List, TS VVs Results, TS VVs Recruitment Schedule and more details. Academic Instructors 2017 Recruitment Guidelines,VVs posts 2017 recruitment guidelines, Selection Guidelines, Remuneration, VVs Application Form, Last Date for apply, District wise VV posts recruitment, Guidelines for engaging Vidya Volunteers, Recruitment of Academic Instructors,TS Schools. Rc.No.44/PS-2-2/2017 Dated:07-11-2017 :: Sub: School Education - Engaging of Vidya Volunteers during 2017-18 - Reg. Read: l.G.O.Rt.No.86, School Education (Prog.I) Dept, dated:25.05.2017. 2. G.O.No.97, School Education (Prog.I) Department, dated :29.06.2016 along with guidelines. 3.This office Proc.Rc.No.44/PS2-2/2017, dated:27.05.2017. All the District Educational Officers in the State are informed that, certain Collectors and District Educational Officers brought to the notice of the under signed that due to announcement of Teacher Recruitment Test by the Telangana Public Service Commission, most of the TET qualified candidates working as Vidya Volunteers are not attending to their duties due to preparation for Teachers Recruitment Test(TSPSC TRT). Due to which it has become difficult to engage TET qualified candidates as Vidya Volunteers. They have requested to relax the condition of engaging TET qualified candidates as Vidya Volunteers. In this regard, they are informed that the Govt in G.O.2nd read above, issued guidelines for engaging the services of Vidya Volunteers for the academic year 2016-17 and the same guidelines are being followed for the academic year 201 7-18. Intermediate with D.Ed. in case of non availability of candidates with D.Ed., B.Ed candidates may be considered. iii. Oriental title I Bhasha praveena I Vidwan in the language concerned or its equivalent with pandit training I B.Ed. in the relevant methodology. 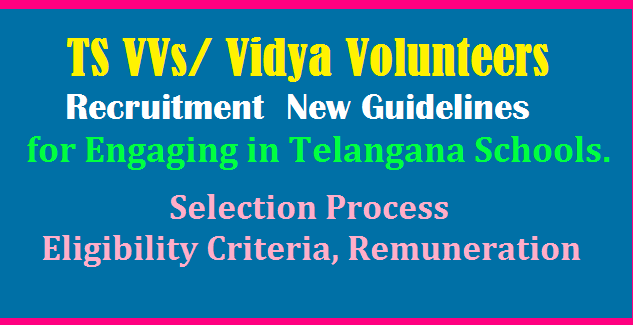 Following weightages shall be given for TET qualification apart from the other qualifications to the eligible candidates who have applied to work as Vidya Volunteers. Teacher Eligibility Test Paper-I - 20% weightage on total marks secured. Teacher Eligibility Test Paper-II - 20% weightage on total marks secured. In view of the above, they are instructed that they may engage candidates as per the above guidelines and engage qualified candidates in the absence of availability of TET qualified candidates subject to fulfilment of all other conditions laid down in the G.O. 2nd read above, and to the extent of number of Vidya Volunteers allotted to the District during academic year 2017-18. G.O.Rt.No. 86 , Dated: 25-05-2017. School Education – Engaging the services of (11428) Vidya Volunteers through School Management Committees (SMCs) with an Honorarium of Rs.12,000/- (Rupees Twelve Thousand only) per month in the Academic Year, 2017-18 - Permission Accorded – Orders – Issued. 1) G.O.Rt.No.97, SE (Prog.I) Deptt, dt.29.06.2016. 2) From the Commissioner and Director of School Education, Telangana, Hyderabad, Lr.Rc.No.44/PS2-2/2017-2, dt.04.02.2017 & 15.04.2017. In the circumstances reported by the Commissioner and Director of School Education, Telangana, Hyderabad, in the references 2nd read above, after careful examination of the matter, Government hereby accord permission to the Commissioner and Director of School Education, Telangana, Hyderabad, to engage the services of 11428 (Eleven Thousand, Four Hundred and Twenty Eight) Vidya Volunteers, in the existing vacancies and retirement and leave vacancies, from the month of June for the Academic Year 2017-18, subject to rationalization of the teachers, based on the enrolment of students. The honorarium of Rs. 8000/- (Rupees Eight Thousand only) sanctioned in the year 2015-16 and 2016-17 is enhanced to Rs. 12000/- (Rupees Twelve Thousand only) per month due to the increase in the cost of living and the requests made in this regard. 2) The Commissioner and Director of School Education is requested to follow the same Guidelines as enclosed to the G.O. first read above scrupulously, in engaging the services of the Vidya Volunteers for the Academic Year, 2017-18. 3) The Commissioner & Director of School Education, Telangana, Hyderabad shall take necessary action in the matter accordingly. Department - Engaging of Vidya Volunteers for Rs.8,000/- per month for seven(7) months i.e., from 21th September, 2015 to 20th April, 2016 - Permission- Accorded - Orders -Issued. 1) From the Director of School Education,Telangana, Hyderabad, Lr.Rc.No.330/ PS2-2/ 2015, dt.23.8.2015. 2) Revised guidelines received from the Director of School Education, Telangana, Hyderabad dt:3.9.2015. In the circumstances reported by the Director of School Education (DSE), Telangana, Hyderabad in the references read above, the Government hereby accord permission to the Director of School Education, Telangana, Hyderabad for engaging (7974) (Seven Thousand, Nine Hundred and Seventy Four) Vidya Volunteers with an honorarium of Rs.8,000/- (Rupees Eight Thousand only) per month, for seven(7) months i.e., from 21th September, 2015 to 20th April, 2016. 2. The Director of School Education is requested to follow the Guidelines for the appointment of Vidya Volunteers for the year 2015-16 as mentioned in the Annexure enclosed scrupulously. 3. The Director of School Education, Telangana, Hyderabad shall take necessary action in the matter accordingly. 1. The Vidya Volunteers will be engaged from 21st September, 2015 to 20th April, 2016 for the schools as approved by the Director of School Education. They are purely temporary and can be terminated before 20th April,2016 also based on justifiable grounds by the School Management Committee (SMC). 2. The Vidya Volunteers shall be engaged to ensure regular functioning of the schools. Candidates should have completed 18 years of age and upper age limit is 44 years as on 1st July, 2015. (5) years relaxation is given in case of SC / ST/BCs and (10) years for Physical Challenged persons. The Candidates shall apply through online mode and submit a signed print out of the application he/she uploaded along with the Certificates required, to the Mandal Educational Officer of the Mandal to which he/she applied within the time specified. The Mandal Educational Officer shall cause verification of the applications with reference to the Certificates enclosed and submit to the District Educational Officer duly countersigned. 7. Engaging of Vidya Volunteers in Agency area shall be from local ST candidates only. If local ST candidates are not available ,then other ST candidate from Agency Area and later non-ST candidates residing in the Agency area shall be considered . Graduation with B.Ed. & Above. The DEO shall place the merit list of the Candidates so prepared before the District Level Committee comprising – District Collector; Project Officer, ITDA/Addl. Joint Collector/Chief Executive Officer, ZP and District Educational Officer as the Member Secretary. The District Collector shall personally head this Committee and oversee the entire process of engaging these Vidya Volunteers. After finalisation of the lists of Vidya Volunteers by the District Level Committee, the same shall be communicated to the Mandal Educational Officers for onward communication to the School Management Committees for engaging the Vidya Volunteers in the school. Any grievance on the above order lies in Appeal to the Director of School Education within a week from the date of publication of the lists by the SMCs. 13. The Cluster Head Master concerned shall be given the responsibility to coordinate with the SMCs concerned in engaging Vidya Volunteers. SMCs will enter into an Agreement with the Vidya Volunteer in the prescribed format. 14. The Director of School Education, Telangana, Hyderabad shall draw a detailed Schedule and communicate the same to the competent authorities to engage the Vidya Volunteers for the academic year 2017-2018.